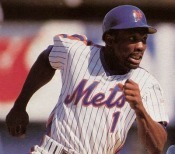 With the release of Luis Castillo, Mets first-base coach Mookie Wilson will reclaim uniform #1. Regardless of what number was on his back, he was always #1 in the hearts of Mets fans. Looking forward to seeing “The Mook” in his old number again.